A rent-to-own or rental purchase contract is intended for the purchase of the instrument the customer is renting. It offers parents a pre-defined term for acquiring ownership of the instrument simply by making the required number of payments. The instrument may be returned at any time, or if the customer wishes to acquire ownership during the term of the rental contract, Ellman's will discount the remaining balance not overdue by 35%. A “Like New” rental instrument has previously been contracted as an instrument rental but, returned to Ellman's before ownership was acquired. These instruments are then sanitized and refurbished by our repair staff and are often indistinguishable from a new instrument. The purchase price for rental-return instruments is discounted approximately 15% at contract's beginning, and if a customer wishes to acquire ownership during the term of the rental contract an additional 35% is discounted from the remaining balance not overdue. Although the IRP and monthly payment remain the same, the term to acquire ownership is shortened. The first year of rent paid on a rental-return instrument may be used to purchase a new instrument at any time during the rental contract. Used instrument are in perfect playing condition however, they do show signs of use. Like the New & “Like New” instruments all repairs necessary to keep them in good playing condition are free throughout the rental. All aspects of the rental are the same except the rental rate has been reduced. If a customer chooses to purchase the instrument during the term of the rental contract (early pay off), 35% is discounted from the remaining balance not overdue. Free maintenance continues for two years from delivery (not purchase) date. The IRP (initial rental payment) fee and monthly rental payments (less $4.50 maintenance and office charge) apply to the purchase price of the instrument, which varies according to instrument. Rent to own instruments include Flute, Clarinet, Trumpet, Cornet, Trombone, Percussion, Alto and Tenor Saxophone, French Horn, Baritone and Oboe. Select "Rent to own Online", and choose the desired instrument from the drop-down box. Contract lengths vary, but there is no obligation past the 2-month IRP. Customers may choose our premium rental or our standard rental in either a new or “like new” condition when renting to own. 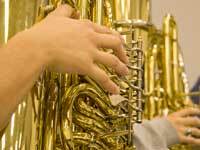 We also offer a limited number of used instrument rentals. Availability of New, Like New or Used instruments cannot be guaranteed.